Today is Tuesday, August 14th, 2018. I’m Kevin Boyle, with today’s W-V-B-I Community Calendar. Today: Computer, tablet and smartphone workshop here at the BIC Center. That’s 10 to noon with tech guru Pat Bonadeo. Also today, the Beaver Island Transportation Authority Board meets at noon at their office on main street. And, the Peaine township Planning Commission meets at 7 at the township hall. Wednesday, BINGO over at the Gregg Fellowship Center. Doors open at 6:15 for fellowship. Games at 7. And, more great music coming to the BIC Center. At the end of the month The Way Down Wanderers will be here. They aren’t limited by genre. They just play great music. Foot stamping fun say the critics. They’re at the BIC Center August 31st at 8. And, coming in September, it’s the Kennedy’s Kitchen. More foot stomping fun from a band that does everything Irish. Kennedy’s Kitchen will be in the Robert Gillespie Memorial Theater on September 22nd at 8. Tickets for both events are available now at the BIC Center front desk or by calling 448-2022. A 20 percent chance of showers after 2pm. Patchy fog before 10am. Otherwise, sunny, with a high near 82. Southwest wind 5 to 10 mph. A 30 percent chance of showers, mainly between 11pm and 2am. Mostly cloudy, with a low around 60. North wind 5 to 10 mph. A 20 percent chance of showers before 2pm. Partly sunny, with a high near 76. North wind 5 to 10 mph. Partly cloudy overnight. Low around 59. Partly sunny, with a high near 77. Northeast wind 5 to 10 mph. At 6 this morning at the pest free Hogarth Pest Control Studios of W-V-B-I –it was 73. Winds mostly calm with an occasional breeze from the ESE. Humidity still high at 97%. Dew point 68. Pressure 29 point 9 and rising. Visibility 10 miles. Around the island at 6… it was 72 at Whiskey Point, 71 at McCauley’s Point, 69 on Greene’s Bay, and 73 on Lake G.
Sun sets at 8:51 today. Up around 6:41 tomorrow. 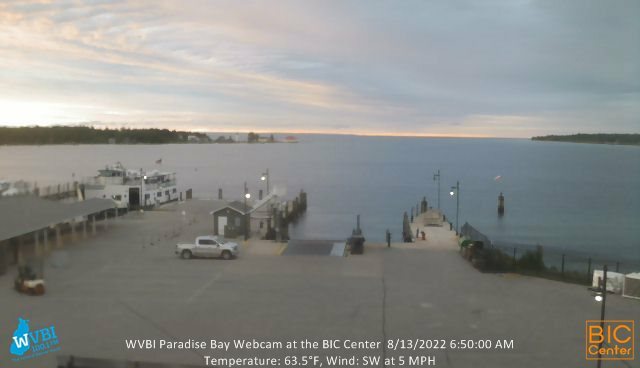 Looking out on Paradise Bay at 6:30 from the Hodgson Enterprises W-V-B-I BIC Center webcam—harbor had just a few ripples. Sunrise underway. Puffy summer clouds and some haze overhead. Birthdays: One today. Logann Crandall. Happy birthday to Logann! If we missed you on our list, happy birthday to you as well. Here’s a thought for today from Dwight Eisenhower: Motivation is the art of getting people to do what you want them to do because they want to do it. Three. His left ear. His tight ear. And his final front-eir. That’s the W-V-B-I Community Calendar for Tuesday, August 14th, 2018.